In the darkened hall, a city-block wide, tourists and ballerinas sit on the floor, do push-ups, throw their arms back, as their images are recorded on the floor and tethered drones whirr overhead. This is what Ai Weiwei and Herzog and de Meuron named “Hansel and Gretel” and ostensibly freighted with the message that Surveillance Is Bad. What this installation inadvertently pre-supposes is: maybe surveillance can be fun too? 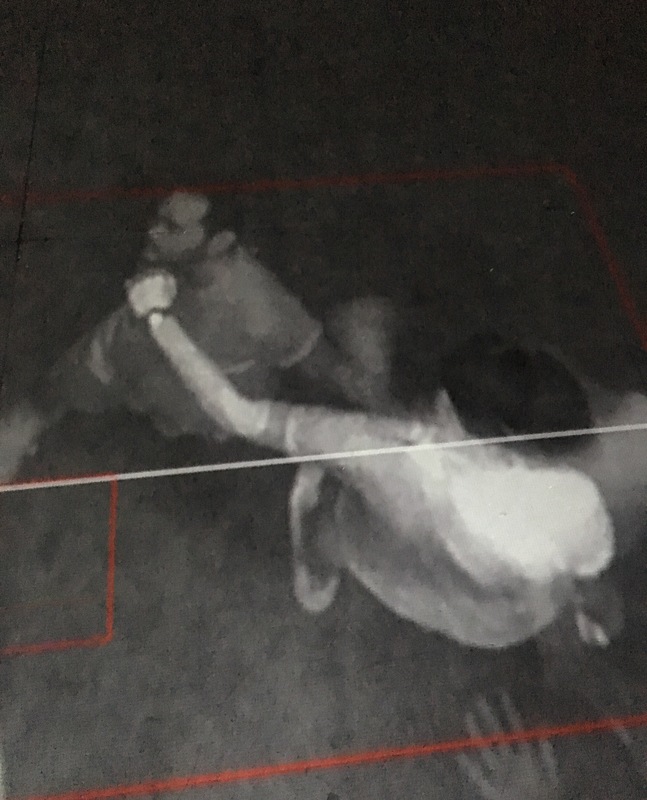 The cameras, constantly tracking viewers, photographing them at intervals, and projecting their images constantly on the floor, turned everyone in the space into performers. The effect is less chilling than it is joyful. In Part 2 of the piece, the standard agitprop about military drone strikes, Chelsea Manning, and Edward Snowden is transmitted via iPad. Also on this iPad are access to live video feeds from cameras at the exhibit, in grainy black and white, handled via YouTube. As I left the building, I observed behind a desk a video monitor, showing color feeds from other cameras still. And here is where the failure of the piece was most clearly rendered, in its unwillingness to truly expose the backstage of surveillance: to show the chain of custody for the video recordings of the Armory gift shop. To identify and feature the private security agency charged with responding to incidents they observe through video surveillance. To show how data from website visits is matched up to live visitor data in order to create what we in the business call “omnichannel journeys.” To outline in plain terms how my credit card information, used to pay the $17 admission, might be used in other ways, the agencies of anonymous white-collar workers who will receive that information, bundle it, return it to the artist for re-publication. Surveillance without threat is just photography, and the massive funhouse mirror is really just fun. Surveillance, conflated with voyeurism, requires multiple parties. Rather than implicating any party directly in the spotlight, it fails to do more than gesture in the direction of a seemingly unknowable monster with unlimited reach. Perhaps the more concerning and perhaps unspoken thing about surveillance is that it has proven to be genuinely helpful. Photographic surveillance is one species of the photography family, with its applications in art and its use as a freezer of memory. In final images of Princess Diana and Dylan Klebold we see examples of how artifacts of surveillance and emotionally fraught snapshots can be conflated. In the age of emails, metadata is a useful tool for verifying the veracity of an otherwise anonymous party in a two-way communication. In the prosecution of a crime, it can bear witness. What threatens Hansel and Gretel is not the abstract presence of The State, but the direct threat of the wolf. Though the two can overlap, they do not overlap enough in this experience to deliver the message that Surveillance Is Bad. They do not introduce any new information to augment our fears of the state. It is live photography, a funhouse mirror at its most joyful. But that wasn’t supposed to be the point. The thing about art about surveillance as voyeurism: the audience knows they are being watched in that moment, but without any concrete, immediate truth to the questions of “by whom” and “why,” does being watched really matter? 1. Move to New York City. Preferably Manhattan. 2. Go to a bar during a daylight hour, by yourself. A wasteful, decadent one. Order a drink. Resist the temptation to smile from heartbreak. At what this city was, and what it still is. What the Justin Bieber remix of “Despacito” and Dunkirk have in common: summer pop featuring three parts, interwoven in constant, rising tension, until the ticking of the watch stops, this is how we do it down in Puerto Rico, only to build again till the credits roll. 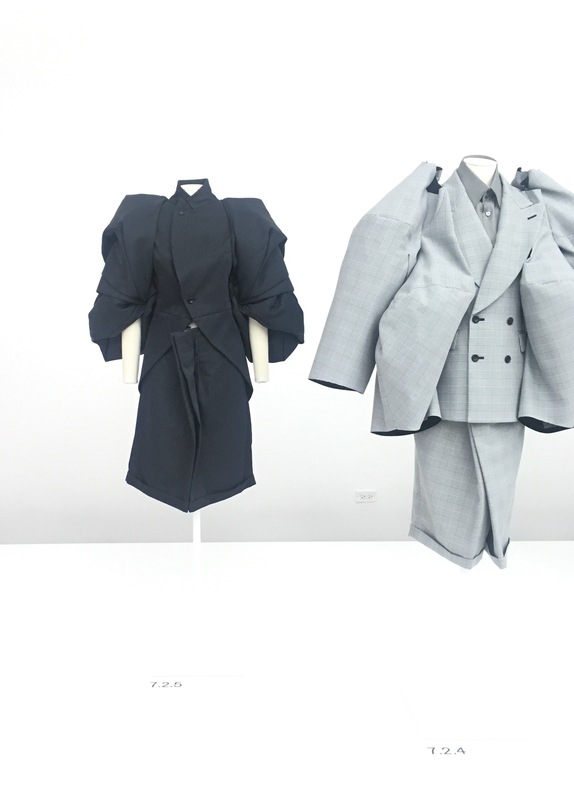 At the Rei Kawakubo exhibit – Art of the In-Between – line up next to a fairly mundane piece, a proportion play in Prince of Wales check, for ten minutes or so. Watch a pair of middle-aged American tourists arrive, snicker “weird,” and leave. Wait till the next pair arrives, a father and young daughter. My back-of-the-napkin estimate is 7-9 years. 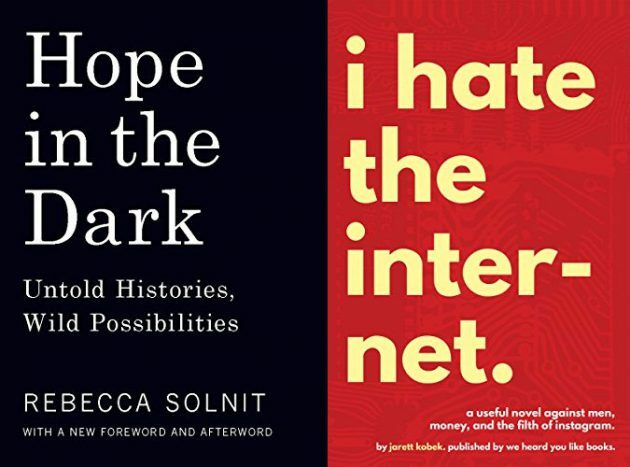 Among the two books I am reading in parallel are Rebecca Solnit’s Hope in the Dark and Jarrett Kobek’s I Hate The Internet, which, as I bounce between their narratives, I realize render so much of what it means to be (as I am) a liberal technologist living in America in 2017. And Solnit is a hard read now. I want to feel as hopeful as she did in the context of the first term of the second Bush administration, when she looked to the evolution of Uruguayan politics for inspiration to get through a dark time. There’s so much on my mind these days it’s hard to know where to begin. I’ve done some good things recently, which I’ll write about in greater detail shortly. But work continues, life continues, and good prose lifts my spirits. Somewhere between hope and hate, I suppose. Things I have been called (and how I feel about them). I have been told I have a great name. A superhero name. Alliterative. As I get older, I think more and more that my name was one of the best choices my parents made on my behalf. Some people like to call me by my name, and some people prefer to call me other things. I have some thoughts on a lot of them. This is my full given name. It’s what I like to be called, so when people ask if I have a preference, I say, “Call me Matthew.” Most people call me Matthew. It used to be I went by Matt, and then I began introducing myself as Matthew though I had no preference whether people called me Matthew or Matt. One morning in DC, a neighbor asked which I preferred and so I answered I had no preference. Still, she insisted I come down on one side or the other. I’ve preferred Matthew since. Old friends still call me Matt because they’ve always called me Matt. New friends sometimes prefer to call me Matt too, and that’s okay. I mostly don’t feel like someone whose name begins and ends in a hard syllable. Rather I’d think I’ve cultivated a measure of civility to end my name in a long vowel, its echo not an arpeggio of clicks but the multi-tracked hum of a long vowel held. When I was younger, some people called me this because I was either precocious or pretentious in their view. Recently, it seems to be in vogue among those who find my bearing professorial. Service workers also address me as this but I’m quick to let them know they can address me by my first name. Still, they tend to persist in calling me Mr. Marco. I was a TA for a photojournalism class when I was a senior in high school and the mostly younger students took to calling me this – the first part presumably for my mentor-like status, the second part for my size. I’ve been called a lot of fat-shaming names in my life, but this is the only one that became my official (and unwanted) mode of address. I don’t care for this name. Among the three, “dude.” Yes, this is a real preference. Largely for the same reason I have issues with the distinction between “hood” and “nabe” as abbreviations of “neighborhood,” and also for my feelings about sibling relationships. I think part of the reason I maintain my professorial bearing is so people aren’t tempted to address me with any of these terms. Between dude/bro/bruh and pare, pare wins. If a panhandler in the States asked for money and addressed me as pare, I’d throw some change his way. I’m generally okay with any direct translation of my first name into another language. These are a few nicknames still employed by just one person I know. All these assignations seemed to be organic and affectionate. If I called any one of these people they’d enthusiastically greet me with their very own salutation. I’d be surprised if anyone other than their originators addressed me with them, but I’m good with them. Old Filipino nickname. Still in use by my parents and relatives. When we first immigrated and I was eager to shed my otherness among my young American peers, I asked my parents to stop using this. Then I got older and I realized how much of my culture I willed out of myself out of this impulse to conform and assimilate. And this Filipino nickname was among the casualties I could still reclaim. I get a little nostalgic when I receive correspondence addressed to Mawy. I never played Marco Polo but I know that exists as a game because I am subject to cries from it pretty regularly. I only know the rules of the game from Wikipedia and some people still think it’s funny to affect the intonation of Marco associated with that game when addressing me. I don’t. Alternately, some people have called me Marco because for some reason they thought I deserved a better name than Matthew. Which I’ve taken to interpret as “we think your inconspicuous given name is unsuitable for you therefore we’re going to address you by your more exotic-sounding last name that is also a given name in many countries.” And ew, no. Don’t ever call me Marco. Somewhat related: a pretty good article on the weird science of naming new products. As an occasional insider to the process, I find it deeply frustrating mostly because of the social interactions that take place in arguments of taste. However, if you’re an outsider, it’s worth reading to see how difficult a good name can be to conjure. Ten years ago, as I left Narita Airport on an express train for Tokyo, I loaded A Love Supreme into my Discman. What I understood then to be the outskirts of Tokyo unfolded as a diorama just beyond my window as “Acknowledgement” churned into its motif. I didn’t know that album very well at the time; I was just an aspiring 20-year-old aesthete who wanted to incorporate it into my cultural arsenal. And it lodged itself firmly there as it became the theme song for the things that I don’t yet understand but desperately want to. That trip to Japan in the summer 2003 (as the guest of a former client and beneficiary of a moment of largesse I’ve yet to pay forward) was the first time that I had been fully disarmed of my ability to communicate. It scared me immensely to be at once surrounded by people and in a void. I was overwhelmed at the time, not very well-off, somewhat primitive in many respects. I wasn’t sure that I’d ever return. Looking back, it was essential to my development as a person, immersed in that situation in early adulthood where my only recourse was to observe and communicate using only the most rudimentary of terms. But it’s a situation I’ve learned to recognize and relish, and even sought again. After that trip, I continued to Manila for an 8-week stay. That summer happened to be the same time Lost in Translation came out, and when I watched it upon my return, it too (however literally) occupied that thematic space with John Coltrane’s modernist jazz. I return to that space with some frequency now, populating it with new songs to remember other thrilling encounters with my language’s permeable membrane, itself an advancing and evolving boundary. Elitism starts where the limits of your understanding begin, I’d believed long before that and held fast since. And today, I’m going back. Running on a really hot day. I try to edit my work in different states of mind. So I’ll go running on a really hot day and then read the 2,000 words I just wrote. Or if I’m upset, or really sleepy, or if I’m drunk, I’ll read this stuff. If you’re sleepy and you find yourself skipping over a paragraph because you’re bored by it and just want to get to the interesting part, it comes out. Those different states of mind are a really interesting filter. Perhaps the feeling that my writing (or my life) is not actually that interesting explains my recent years of verbal constipation? Or maybe I should just type faster and hit “Publish”? Using the phrase return to form to describe the state of one’s artistic production seems a tacit admission of irrelevance, like R.E.M. or The Simpsons in the 21st century. And I am demanding exactly that of myself this morning, with you as my witness: my own return to form. I’ve long maintained that you have to be prolific before you can be good. A corollary, I’ve learned, is that you have to stay prolific in order to stay good. A shabby score on a (brilliantly made) kerning test set it off last night, but it’s been percolating for years. 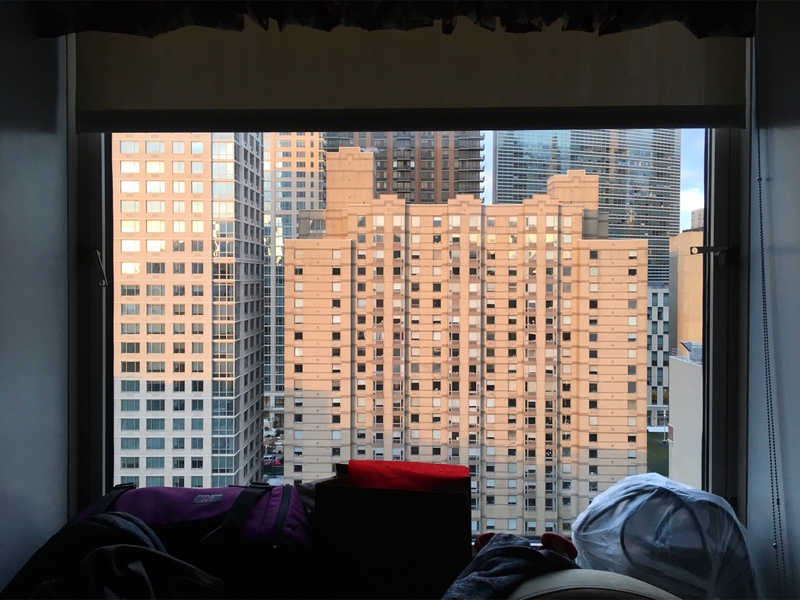 It’s been a while since I’ve expended the effort to write well about wrinkles of the world I’ve inhabited. Writing and designing were not previously practices meant to imbue me with cultural relevance so much as they were personal relevance: they were means to accrue self-confidence. Somehow, as the former became a byproduct, it was that I pursued. 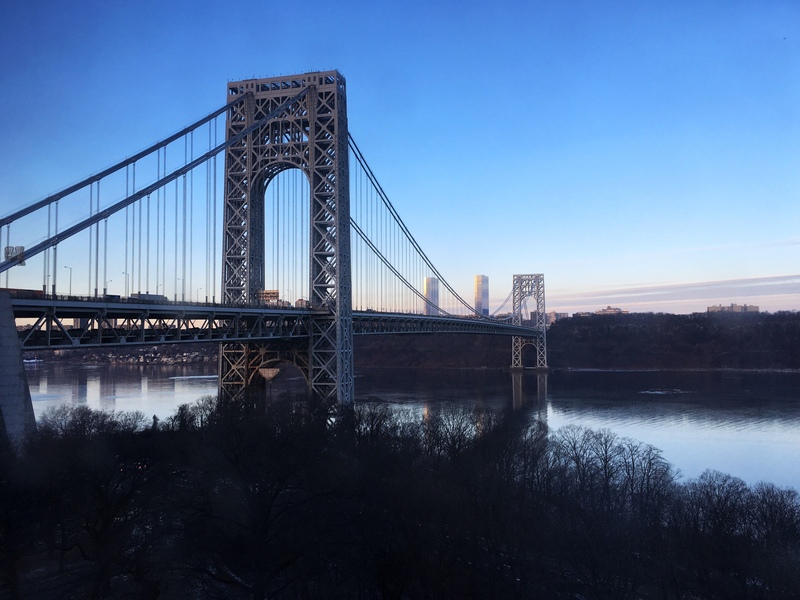 And it felt good – to have references queued up, flexibility and mobility in my career, disposable income, a role as a mentor – to have all those things afforded by a body of substantial work to one’s name. And I forgot to make work that was relevant to myself. And when it stopped being relevant to me, I stopped making work as often. And when I stopped making work, I forgot how to make good work. And I won’t be making good work for a while – I hope it’s a little while and not a long while. But I’ll be making work, and I hope that I produce something I judge favorably before too long. I’d like to believe it’s not so much that I’ve forgotten how to write as I’ve just forgotten to write. Please bear with me as I test this hypothesis. Posted on 9 October 2011 Categories IntrospectionLeave a comment on Return to form. I have a godmother who I consider the consummate workaholic. She runs a care home, which is a demanding job as it is, but she lives as though there is no such thing as a spare moment—not as though there is always something to do but as though there is always something that needs to be done. I have never seen her sleep. When I would visit her in Stockton with my family and we would return to her house after a late night, she would be immersed in some manner of household chore while we were readying ourselves for sleep. I would pass out on the sofa watching her shadow on the ceiling in another room—the only room in the house still lit at that hour. In the morning, she would be at the care home or running errands or otherwise occupied. The full breakfast she cooked and laid out on the kitchen table was already cold, and the more perishable items would be back in the refrigerator. During those visits, I felt that I was lazy in comparison, and for whatever reason, I felt that she regarded me an inferior person because of it. Somehow, I felt that I would not live up to her standard if I did not also keep myself occupied in necessary labors at every waking hour. Towards the end of my high school years and into college and afterwards, I did not join my parents when they visited her on long weekends. Although I had not seen her for a few years, when she heard from my mother about my move to Washington, she sent boxes of pots, pans, lamps, soap, toilet paper, ramen noodles, and so forth. I called to thank her, and she asked how I was acclimating to life in my new city, how I spent my days. I told her. She said I should go out and meet people. She advised me to do something besides work. Originally published 22 May 2007. Posted on 22 May 2007 30 August 2013 Categories Introspection, Nostalgia, WorkaholismLeave a comment on On workaholism.